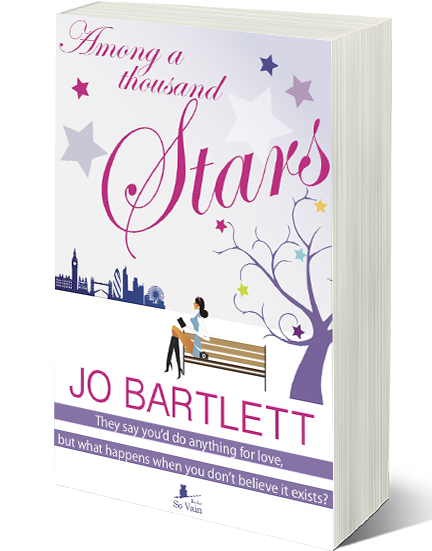 BleachHouseLibrary.ie: Review and Guest Post: Jo Bartlett, author of "Among a Thousand Stars" discusses choosing character names. Review and Guest Post: Jo Bartlett, author of "Among a Thousand Stars" discusses choosing character names. When her mother turns up naked and proud during her first term at college, Ashleigh Hayes assumes that life can’t get any more embarrassing. Ten years later, with best friend Stevie at her side, and a successful career as a freelance photographer for monthly magazine Glitz, it looks like she might have finally got the hang of things. Only she seems to have inherited the embarrassment gene from her mother and her every encounter with new boss, Tom Rushworth, looks set to send her career spiralling backwards. Getting past their shaky start, Ashleigh and Tom embark on a relationship that was only ever meant to be a bit of fun. But when life, paparazzi and love-sick Labradors get in the way, they suddenly find themselves caught in a roller coaster ride of emotions. If you read my author bio, it describes how my career in teaching affected my ability to be able to choose a name for my children when they came along, as so many of the teenagers I’d met along the way had put me off certain names for life! In the end I settled on fairly classic names, that didn’t have any negative associations, but it took a long time – especially as my two sisters became mums before me and used up a lot of my favourite names. Creating characters means choosing a whole host of names and there were some I needed to avoid before I even started – the names of my immediate family and close friends, for example. I didn’t want anyone thinking a character was not only named about them, but also based upon them. That could have opened up a whole can of worms! There are certain names that definitely don’t say hero to me, either because of those negative associations on the stereotypes that go hand-in-hand with them. Then there’s the generational thing, names that used to be popular but would make someone sound of a certain age now – Albert, Brian, Clive, Douglas – there’s at least one for every letter of the alphabet. That’s not to say I don’t love some of those names, my dad was called Brian and he gave me a love of reading, so the book is dedicated to him, but it just didn’t cut the mustard for a thirty something hero. So, in the end, I chose Tom – a good, classic, solid, man-for-all-eras type of name – but that was just the start of the names dilemma. Once I got a publishing deal, my editor at So Vain Books, felt my original title was a bit too cheesy. We tried brainstorming loads of different things, linked to the setting and the protagonist’s occupation, but none of them felt right. Then I was listening to Ed Sheeran’s ‘Thinking out Loud’, where he sings about kissing his girlfriend beneath the light of a thousand stars and I suddenly had my title – Among a Thousand Stars – which luckily my editor also thought was the perfect fit. Finally, there was the pen name option to consider and, wanting to separate my writing and professional life, I chose a slight variation on my name. Only, a little while down the line, I discovered the name I’d chosen was also the name of a US evangelist and exorcism expert. So, it was back to being plain old Jo for me, as anyone buying my book and hoping for one of his would be sorely disappointed! "I was a little hesitant when I started this book as the light hearted romance/chick lit genre is not something that I am a fan of but I was pleasantly surprised. Set against the backdrop of Glitz magazine, Among a Thousand Stars is a story of hope, friendship and love with a little glamour thrown in for good measure. Ashleigh is a photographer who works with her best friend Stevie who acts as a stylist on most of their shoots. Familiar with all the tricks of the trade used to present the perfect image to the outside world, it is little wonder she is sceptical and finds it hard to take things at face value when it comes to affairs of the heart. While Stevie is happy to play with gay abandon, Ashleigh is a little more wary. An encounter with PR head and her new boss Tom Rushmore at his engagement photo shoot causes tension between the two but when Tom's engagement is called off and work makes them cross paths more often they have a chance to get to know each other better. They discover their upbringing was quite similar not least because of the lack of true love between their respective parents. Can they overcome their doubts and fears about love or will they become just another celebrity casualty? This novel moves along at a nippy pace. There is drama, heartbreak and some genuine laugh out loud moments along the way that one can dip in and out of making it the perfect summer read." Among a Thousand Stars is published by So Vain Books and is available in paperback and ebook format.